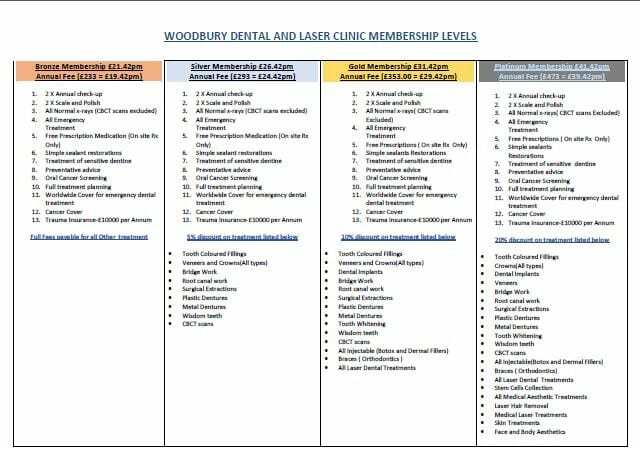 Our Woodury dental care plan allows you to spread the cost for your routine dental care with affordable annual payment setup. Your annual payments also cover the cost of an agreed number of hygiene appointments. Having your teeth professionally cleaned, to remove plaque and calculus, can help you combat gum disease, as well as making you feel good about your smile. Dental insurance is provided to all our members in return for an annual payment. This includes cover for worldwide emergency treatment, evening, weekend and bank holiday call out fees, treatment following dental injury, hospital benefits and oral cancer diagnosis. Please download our insurance policy for full details.